The dealer is trying to pull a “yo-yo financing” or “spot delivery” scheme. 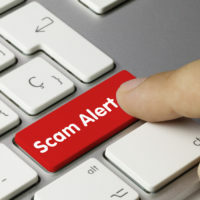 Continue below for details on the yo-yo financing scam and how to defend yourself, and contact a California auto fraud attorney if you believe you’ve been a victim of auto dealer fraud. Dealers will typically play this trick on customers with less than stellar credit, someone who has experience with unfavorable interest rates and other terms. The salesman will offer a deal that seems too good to be true: low money down, a great interest rate, etc. The customer is allowed to take the car home “on the spot,” before the deal is finalized, with assurances that the seller just needs to go through the motions of the paperwork after the customer leaves. Some dealers will even complete the deal with approved financing and still try and pull the scam. Dealers know that in California, a car sale can be rescinded within ten days if a dealer is unable to find financing. The dealer will call the customer a few weeks later with some made-up problem and demand a higher interest rate and/or more money down. They may claim it was an innocent mistake, or that you lied to them about your credit, or any number of other stories. They hope that you will just agree to avoid the hassle, now that you have an attachment to your new car. If you refuse the new terms, they will often resort to bullying: they may threaten to destroy your credit or call your employer and tell them you are a deadbeat, or even to report the car as stolen, trying to flip the situation so that now you are the one cheating them. First and foremost, you need to understand that their new justifications are all fake: this is nothing but a cash grab. Generally speaking, you will be in one of two situations: If you completed all the paperwork and you have a completed contract in hand, and it has been more than ten days, then the deal is complete and the car is yours. They cannot change the deal after the fact, no matter what they claim. Note that some dealers will send a letter dated ten days after the transaction but will actually mail it later; if this happens to you, make sure to keep the postmarked envelope in which the letter came so that you can prove the letter was backdated. If you took the car home without completed financing and transfer of ownership, a true “spot delivery,” then you can simply return the car for a refund of your deposit and, if applicable, a return of your trade-in. The same applies if the dealer cancels the deal within the ten day period permitted under California law. You are under no obligation to change the terms and sign a new, modified contract. If the dealer already sold your trade-in vehicle, they owe you a refund of the greater of either the trade-in value as stated in the contract or the vehicle’s fair market value. If you are being bullied by a dealer, keep all of the details of your transaction, including all paperwork and other correspondence. An experienced auto fraud lawyer can help you prove that either the terms of your original agreement were final, or that you are free to return the car rather than agreeing to new, unfavorable loan terms. If the yo-yo financing scam caused you actual financial hardship even aside from getting your trade-in or money back, you may be able to bring a consumer fraud lawsuit against the dealership. If you’ve been the victim of fraud when purchasing a car in California, find out if you have a right to compensation by contacting the dedicated and passionate California auto fraud lawyer Nick Nita for a free consultation, in Los Angeles at 213-232-5055, or statewide at 877-921-5256.